Warm and Welcoming Beach House with Lots of Room & Ocean Views! 7/35: Open and bright with all the double doors. 14/35: Queen bedroom on main level with private ensuite bath, overlooking pool. 15/35: Queen bedroom on main level with private ensuite bath, overlooking pool. 29/35: Private ensuite bath in 3rd floor suite with tub/shower combo. Property Size 3,126 sq. ft. The well-planned layout of this home can comfortably accommodate up to 14 adults or 4-5 families with children. It features 6 BEDROOMS and 5-½ BATHROOMS, including 3 King Masters, 1 Queen Master, 1 Triple Queen Bedroom and a Bunk Room with full-over-full bunks (2 full-size beds). You’ll enjoy nice ocean views from the 2nd & 3rd-floor balconies. For the convenience of our guests, we have also included a full-size washer and dryer, an iron, ironing board, broom, and a few cleaning supplies. We keep our home clean and well-updated and pay attention to amenities you expect, such as high-speed wireless internet (free wifi), nice flat-screen TVs, high-definition cable, hair dryers in each bathroom, and more. We also provide items our smaller guests may need like a high chair and pack-n-play. The complimentary 4-PASSENGER GOLF CART makes it easy to get around the Crystal Beach area. The wide open spaces continue in the chef’s kitchen with incredible tile floors, custom cabinets and granite counters, and new stainless appliances (including an extra-large refrigerator with 2 ice-makers). The beautiful beadboard ceiling is another example of the creative details added to this home. A stunning granite island/bar wraps around the kitchen and is open to the living area with 5 barstools, There’s also a kitchen breakfast area (with seating for 4) with a nice view of the pool. You’ll find all the dishes, pans and utensils you may need, a Keurig D-Cup coffee maker, as well as a regular drip coffee maker, a toaster, blender, crock pot, and even a few spices, to get you started. The beautiful, open dining area has a large table with seating for 10. This inviting bedroom is full of light and features a KING BED, wood floors, a beautiful wood headboard and access to the large front balcony with ocean views. You’ll also find a bedside table with reading lamp, a dresser, and a large closet. This room shares the full bathroom with the bunk room on this floor. Children, teens, and even adults love this extra large private space with 3 QUEEN BEDS, beautiful wood floors, and windows throughout. There’s a dresser, bedside tables with lamps and a flat-screen TV with DVD player, as well as a great seating area with two sofas - a perfect spot to gather for indoor fun. This space has it’s own Mitsubishi air conditioning unit with remote control - so you’ll be comfortable all of the time. Perhaps, best of all, this room opens to an amazing 3rd-floor wrap-around balcony with great views! This full bathroom features a vanity with sink, commode, and tub/shower combination. You’ll also find big fluffy bath towels and a personal hair dryer. This lovely Carriage House is next to the private pool behind the main house. Inside you’ll find a comfortable living area with a queen sleeper sofa, chairs, and a flat-screen TV. Included in this space is a kitchenette with a full-size refrigerator with ice-maker, double sinks, drip coffee maker & microwave. There is also a washer/dryer combination appliance in the carriage house to supplement the ones in the main house. A small table and chairs make a great spot for morning coffee or a snack. There’s also a King bedroom and full bathroom in this extra house, and you can just step outside to enjoy the pool! 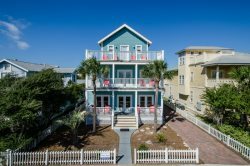 This home is in the heart of Crystal Beach, a quiet, walkable neighborhood with white picket fences and easy access to shopping, restaurants and activities in Destin. Destin Commons, a beautiful upscale shopping and entertainment center, is less than a half-mile away. It features over 75 shops and restaurants, including Bass Pro Shop, World of Beer, Panera Bread, Uncle Buck's Fish Bowl & Grill, AMC Theater with IMAX and much more. A local favorite, Camille’s, is an easy walk around the corner and The Crab Trap is about a mile east. You can bicycle, scooter, Jet ski and go para-sailing all within walking distance. The Silver Sands Outlet mall is not far for those who enjoy “retail therapy”! It was great working with everyone. The entire family had a great stay. We really enjoyed staying at your property. Thank you!